I woke up, slightly confused at first. I immediately got out of bed and shut the alarm off, which was across the room. The clock read 2:55 am. I got into the unfamiliar shower. I couldn’t say how long I let the water beat against my head. I put on the many layers of clothes which I had set down on a chair the night before. I combed my hair, took a look at myself in the mirror, and left into the terrible February cold, flashlight in hand. It was raining. I sloshed through the puddles, a parking lot, a foot bridge, and finally the winding sidewalks. When I took my seat in the church, most of guys were already there. They looked relaxed, as if about to warm up for a soft ball game. At 3:20 am, one of them stood up, walked about two feet, and activated the bells from an electronics box. They rang from a tower right outside, and the noise pierced the 50 foot ceiling of the church. Everyone stood, and I followed suit. As the bells died down, a knock emanated from somewhere. The men traced a cross on their chest with their finger, and bowed deeply towards the front of the church. Some one sang “Lord, come to my attention.” The men responded back “Lord, make haste to help me.” They recited the Lord’s prayer, which was different from the protestant version with which I grew up. The cantor, with his guitar, began to play, and the men began to sing. I looked at my music stand, and it was littered with pages, books, and booklets. A brother walked over to my stand, saw an opened book, and sternly pointed to the song they were singing. I had come to Mepkin to make sense of my life and to make sense of myself. But it was too early in the morning for anything to make sense. I got a scant five hours of sleep the night before, as I wasn’t used to an 8 pm bedtime. The Benadryl I had taken to aid my slumber was still doing a number on me. I felt like I was in a dream, as if nothing as fantastic as these ancient practices could actually exist. I tried to meditate. I walked. As the 24 hour mark approached, I wondered if I could handle 29 more days. I didn’t feel at peace, I felt harassed. Chop this, mop that, you can’t go over there, prayer is in five minutes. I felt confused and out of place. The problem, as I suppose is also the problem for anyone new to the monastic life, was that my mind was too quick for the monastery. My thoughts usually leapt from thing to thing. Our modern world encourages us to split our attention. Multi-tasking is an essential skill. I could read a book while listening to music and watching a movie in between texting my friends like the best of my friends. But, the activities and structure at the monastery were not conducive to this style of thought. It harkens back to a lifestyle that wasn’t uncommon just sixty years ago. You had to shift your focus often, but it had to stay on whatever task you were doing at that moment, whether it be singing, working, or eating. There were no distractions. On the second or third day, my mind finally slowed to the right speed. I was no longer confused, and reveled in the simplicity of the schedule and the life. My old life had involved working in law enforcement, and my job involved lots of multi-tasking. I juggled many tasks, and so became master of none. I had left my job just two days prior to my arrival at the monastery. I had seen more than my share of the darker corners of the world during my old profession. Prior to my arrival, I had assumed that I would be unpacking a lot of baggage, wrestling with the past while searching for conclusions. But, for the most part, that’s not what you do at a monastery. You sing to God. You talk to God. You work for God. And you listen to God by clearing your mind and ceasing thought. Asking about tomorrow in a monastery is a silly question. It’s going to be a lot like today, and seem eerily familiar to yesterday. So, you stop thinking much about tomorrow or yesterday. You live in each moment. You concern yourself with each moment until the next one comes. Three weeks went by before I realized that I hadn’t really dealt with my past. I had spoken with Father Guerric about it once or twice, but it hadn’t permeated my thoughts otherwise. On occasion, I’d think about my future, but my free moments were generally spent reading the multiple papers that appeared in the reading room each day. I made a list of goals that I wanted to complete once I left Mepkin. But the past was the past. I let it be, and it didn’t bother me in the lawns or halls or the Church of the monastery. I spent most of my time working on the mushroom farm the monks kept. My first assignment was to work with John. John had been a monk for two and a half years. Because he was not yet a full monk, when in Church, he wore all white robes, and due to winter, he wore a white cowl as well. With his graying hair, John looked more like a jedi than a monk. When I met him by the bike shed to go to the farm, he was dressed more like a typical Dad, with chino pants and a worn polo shirt. John had lived a life before the monastery. He used to be a district manager for a grocery store chain. His expertise was useful, and so he acted as the head mushroom grower. He picked what to grow, when to grow it, and when to cultivate it. I’m a naturally curious person. As we rode around the farm grounds on a golf cart, I peppered John with all sorts of questions. The growing method was unique. The monks once had a large 50,000 hen egg operation. However, the monks had decided to go into mushroom cultivation. Due to the infrastructure that was already in place, the monks had retrofitted the farm. They would take hay and cotton seed hull and boil them in barrels inside one of the old chicken houses. This would keep anything other than mushrooms from growing in the fertile, moist mushroom growing environment. Then, they’d sprinkle the mushroom spores on this cooked mixture, and then put the mixture inside of 4 foot long, tube shaped plastic bags. They would take the bags to converted tractor trailers which are humidity and temperature controlled, poke holes in them, and hang them up. A few weeks later, mushrooms would appear out of the holes. “John, why are some bags black, and some bags clear?” I asked. “Well, we use the plastic bags as a kind of test, to see what’s going on with the rest of that batch. If things are going bad, we can tell right off the bat, because if one bag is bad, it’s not an isolated incident.” It made sense. “But why are black bags used? Why not make them all clear?” John spoke to me with a Dad’s patience. “We used to use only clear bags. But we found out that when the mushrooms have to work to get to the light, they grow stronger and better.” John didn’t realize how profound his words seemed to me to be. I worked on the mushroom farm, cleaned the senior wing (where the elderly monks resided), and had helped cook in the kitchen. I was interacting with the monks, and was finding them to be an extremely friendly, humble lot. I love to cook, and I was fortunate enough to help in the kitchen on a few occasions. Father Joe was the cook. On my first occasion in the kitchen, while I chopped tomatoes, I asked him questions about Catholicism that I had had for years. He patiently explained different aspects of the religion. As we spent more time in the kitchen, I learned more about Catholicism, and he learned about me. He had me shine the commercial sinks in the kitchen for my afternoon work one day. Later that day, he pulled me aside to let me know how good he thought they looked. I don’t know why, but that simple act moved me. At the last lunch I worked with Father Joe, he was cooking root vegetables, but he didn’t think they had enough going on. He asked me what I thought, and I helped him to add things to create a new dish out of the vegetables. I was just a temporary guest, but he never made me feel that way. He cared about what I thought, and honored me by asking my opinion and taking it to heart. Two weeks had passed, and it had been years since I had felt that happy, that at peace. My cell phone, my computer, and my television had all dulled my sense of the present. And in living in the present, I could appreciate the tiny, little moments that slip through the cracks. At the conclusion of compline, the last prayer of the day, you silently walk to the front of the Church, where the holy water is kept. The Abbot splashes each person with the holy water, and then each person silently goes to their quarters. As I exited the Church one evening, I saw brother Joseph in front of me, standing completely still, looking upwards. I found this strange, so I looked upwards as well. I was greeted with the most spectacular starry sky I’d ever seen. Brother Joseph and I both became lost inside the constellations, if just for a moment. We both broke our glares at the same time, looked at each other, and smiled. That sky was ours, and it was our secret. It had always been above my head, but I never slowed down enough to look at it or appreciate it. We silently continued towards our rooms, smiles intact. I couldn’t believe when my fourth week at the monastery rolled around. Time was passing at a terminal velocity. My mind and body had grown accustomed to the schedule, so right after compline, at 8:00 pm, I was ready to go to sleep. Each day felt like a constant crescendo from the moment I awoke. In the early morning, you have four prayers, breakfast, reading, and meditation. Around 9:00 am, you begin work. I would generally ride a bicycle to the farm and spend my time hauling, carrying, pitchforking, and sweeping. After that, I’d wash up, go to the noon prayer, and then we’d all eat in the refectory. Afterwards, there is a brief siesta, and then the afternoon work, which generally involved cleaning, and then about two hours of free time before dinner. Dinner, or “Supper,” in monk parlance, would be followed by prayer, and then, at 7:35, compline. Each event would flow into the next. I stopped worrying about time, and did whatever activity that was prescribed until it was over. Sometimes, I’d feel like I had read the paper for only 15 minutes, when it had actually been 90. Alarm bells rung throughout the buildings to warn that a prayer would soon commence. Time seemed to have different properties at this place. The days passed quicker than I had ever experienced. Each day would keep picking up momentum throughout. The monastic life can be seen as a constant meditation. In this meditative life, I found peace and solace. I didn’t worry about what my friends were doing in the world without me. I was fully satisfied to labor, pray and meditate. It was a simpler life than the one I had come from, but it was a life that I had come to embrace. After 30 days, my time at Mepkin had come to a close. As I prepared to leave, I realized how much I was going to miss the place, and more so, the monks. I was prepared for many of the aspects of the monastic life, such as the vegetarian diet, 3 am wakeup call, and lack of modern trappings. But the thing I hadn’t expected was the community. I had come as a mere guest wanting to experience their life. But, over the course of my stay, I was embraced by the community. I didn’t feel like a guest or observer. I felt like I had a place amongst these men dedicated to the contemplative life. It can sometimes be hard to find Christ’s love in the modern world. But in the monastery, I truly saw what it was for one to love their brother as themselves. I hugged many of the brothers goodbye, and they shared very kind words with me. 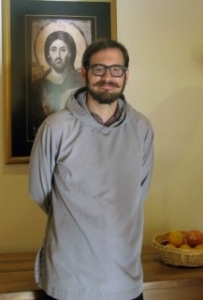 The toughest part of my stay at Mepkin was figuring out what I could take of the monastic lifestyle with me. I still meditate. I try and slow things down in my life. I try to appreciate the small moments that we pass over. I often times keep my phone on silent, and I rarely do two things at once. Now, a few months out of Mepkin, I’m very happy. My life is passing almost as quickly now as it did in the monastery. I focus less on the things I have in my life, and more on the friends and experiences. At its core, Mepkin Abbey is about living the contemplative, monastic lifestyle, which is seen as a solitary effort. But it would be nothing without the community of monks loving and caring for each other to support their individual efforts. That’s what I strive towards in my life, to build and maintain a supportive community amongst my friends. That’s what I’ve taken away, and that’s what I’m trying to give back.